Albert Shipp Pegues was born circa 19 February 1874 in Cheraw, Chesterfield County, South Carolina. He was known as Shipp. Wesley Leatherwood Pegues appeared in the US federal census of 1 June 1880 in Shiloh, Sumter County, South Carolina. Other members of the household included Albert Shipp Pegues, Jane O. Pegues, Frank E. Pegues, Arthur Clarence Pegues, Walter Dickinson Pegues, Barnwell Pegues and Herbert Henry Pegues. Also in the household was one domestic servant. The following appeared on 25 June 1891 in The News and Courier: (Cheraw) Messrs Herbert and Shiff Pegues, of Wofford Colleger, are visiting in Cheraw. The following appeared on 3 September 1895 in The State: Messers. Shipp and Herbert Pegues are visiting friends and relatives in town. The former is from Georgetown, Texas, and the latter from Darlington, this State. He married Pearl Irene Lockett, daughter of Melville Beveridge Lockett and Annie Missouri Johnson, on 6 June 1899 in Williamson County, Texas. Albert Shipp Pegues and Pearl Irene Lockett appeared in the US federal census of 1 June 1900 in Georgetown, Williamson County, Texas. He was a teacher, according to the 1900 census. The following appeared on 1902 in The Sixth Decennial Catalogue of the Chi Psi Fraternity, published in 1902: (Alpha Tau Chapter, Wofford College, Class of 1892) Albert Shipp Pegues, A. M., Georgetown, Tex., Teacher, Southwestern University. Principal Hampton (S. C.) high school, 1893; instructor in English, Southwestern University fitting school, 1893--; brother of Barnwell Pegues, '89, H. H. Pegues, '94; uncle of F. W. Pegues, '93. Albert Shipp Pegues and Pearl Irene Lockett appeared in the US federal census of 15 April 1910 in Georgetown, Williamson County, Texas. Boarding in the household were six students and two domestic servants. He was employed as a university professor, according to the 1910 census. The following appeared on 16 June 1915 in the Fort Worth Star-Telegram: The resignation of Dr. Claude Carr Cody, A.M., Ph.D., as dean of the Southwestern University, was accepted at a meeting of the board of trustees Friday. His thirty-six yars of service at the school was eulogized by Dr. C. M. Bishop. Prof. Albert Shipp Pegues of Wofford College, North Carolina, was elected to succeed him. . . . The following appeared on 16 June 1915 in The Dallas Morning News: The board of trustees of Southwestern University met last Friday and organized for the ensuing year. . . . The resignation of Dr. Claud Car Cody as dean of the University was accepted with regret. Suitable resolutions were passed praising his good work for Southwestern. To succeed Dr. Cody, Prof. Albert Shipp Pegues was elected. Professor Pegues has recently had the degree of LL.D. conferred upon him by his alma mater, Wofford College of Spartanburg, N.C. The following appeared on 20 May 1918 in the Fort Worth Star-Telegram: (Georgetown, May 20) Colleges and universities of the country will be provided with military instructors by the government beginning with the sessions opening in September, Dean A. S. Pegues of Southwestern University, has been notified in a letter from the war department at Washington. . . . The following appeared on 20 September 1919 in The Dallas Morning News: Entrance examinations for Southern Methodist University will begin Tuesday morning, Sept. 23, it was announced yesterday by Dean A. S. Pegues of the college of liberal arts. Freshymen and seniors will register at the university Sept. 25 and sophomores and juniors Sept. 26. Classes will begin the following Monday . . . .
Albert Shipp Pegues and Pearl Irene Lockett appeared in the US federal census of 1 January 1920 in Highland Park, Dallas County, Texas, at 3413 Harvard Avenue. He was a university dean, according to the 1920 census. The following appeared on 13 December 1920 in The Dallas Morning News: This morning marks the beginning of the fall term examinations at Southern Methodist University, which will continue through Saturday, according to announcement by Dean A. S. Pegues of the academic department. . . . The following appeared on 9 January 1921 in The Dallas Morning News: Only one of the fifty students of Southern Methodist University who failed to make their courses was a graduate of the Dallas High Schools, according to A. S. Pegues of the College of Liberal Arts. The announcement was made to the students body Friday morning. . . . 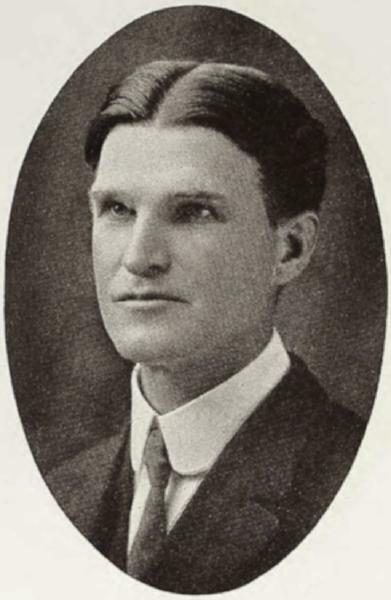 The following appeared on 13 June 1921 in The Dallas Morning News: The Sixth annual convocation sermon of Southern Methodist University was preacned yesterday at 11 a. m. in Dallas Hall by Dr. Paul H. Linn, president of Central College, Fayette, Mo. The seniors occupied seats in front pews which had been reserved for them. There are 107 students at the university who are to receive degrees at the graduation Tuesday.
. . . Psalms 121 and 125 were read responsively, Dean A. S. Pegues of the college of liberal arts leading. . . . The following appeared on 12 February 1922 in The Dallas Morning News: E. B. Jennings, dean of Texas Woman's College, at one time president of John Tarleton Collega dn professor of education at the University of Texas, has been chosen to succeed Dr. A. S. Pegues as dean of the college of liberal arts of Southern Methodist University, Dr. Boaz announced yesterday. Mr. Jennings will take up the duties of the dean Sept. 1. The acting dean, J. P. Comer, prefers to devote his entire time to the teaching of political science and will return to that department of the university upon the arrival of Mr. Jennings. . . .
After the departure of Dr. Pegues the president requested Mr. Comer to assume the duties of the dean with the title of acting dean for an indefinite period. Mr. Comer had served in this capacity before in 1918-19. Dr. Boaz said in commendation of the work of Mr. Comer that he has done remarkably well and has handled successfully many difficult situarions. . . . He married Flora Meta Piehler, daughter of Franz Piehler and Lennie (? ), circa 1923. The following appeared on 30 April 1929 in The Index-Journal: Friends here will learn with sorrow of the death of Frank Pegues, long prominent in T. P. A. circles and a highly esteemed citizen of Darlington, who died at the Florence infirmary Sunday afternoon after an illness of two months. Mr. Pegues was born in Morlboro county in 1861, the son of the late Rev. Wesley Pegues and Mrs. Amanda Oliva Dickerson Pegues, early settlers in that section and members of the influential Pegues family. Mr. Pegues married Miss Constantia Thompson, only daughter of the late Maj. B. T. Townsend of Society Hill, and he lived there during their early married life. About 35 years ago Mr. Pegues moved to Darlington where he was actively identified with all of the community's interests. He was especially interested in the T. P. A. organization and for many years served the local post as secretary. He was a very active and influential member od Trinity Methodist church.
. Funeral services were held today from that church at 11:30, conducted by the Rev. Walter I. Herbert, pastor. Mr. Pegues is survived by three daughters, Miss Mary E. Pegues, Mrs. Cornelius Collock and Mrs. Eugene Ware of Greenville; and three brothers, Walter Pegues, of Cheraw, Shipp Pegues of New York and Herbert Pegues of Norfolk. Albert Shipp Pegues and Flora Meta Piehler appeared in the US federal census of 1 April 1930 in Yonkers, Westchester County, New York, at 649 Van Cortland Avenue. He was a professor at New York University, according to the 1930 census. Albert Shipp Pegues and Flora Meta Piehler appeared in the US federal census of 1 April 1940 in Yonkers, Westchester County, New York, at 274 Park Hill Avenue. Other members of the household included Barbara Ellen Pegues and Robert Shipp Pegues. He was a university teacher, according to the 1940 census. The following appeared on 8 January 1943 in The Herald Statesman: Miss Barbara Ellen Pegues, of 274 Park Hill Avenue [Yonkers], organist and choir director of Lincoln Park Community Church and winner in 1941 of the Chaminade Scholarship to the Juilliard Institute of Musical Art, is the fiancee of Aviation Cadet Donald Clark Godfrey, Army Air Forces, of 159 Glenwood Avenue. The betrothal was made known by the future bride's parents, Professor Albert S. Pegues of New York University and Mrs. Pegues. Cadet Godfrey is the son of Mr. and Mrs. J. Clark Godfrey. Miss Pegues, who studied at Juilliard for a year, is a graduate of Yonkers High School, is now preparing for organ work on the radio. The prospective bridegroom attended Barnard School and Peddie School and was employed by the American Cyanamid Company in New York before enlisting in the National Guard in 1941. He transferred to the Air Forces, received preliminary training at Kelly Field and is now stationed at Santa Ana, Calif.
Mr. Godfrey and Miss Pegues have just returned from Los Angeles where they spent two weeks and visited Cadet Godfrey. The following appeared on 3 February 1944 in The Nassau Daily Review-Star: New York university, school of education, will open the spring term in Nassau with two off-campus courses to be held at the new courthouse, Mineola. The purpose of the classes is to provide an opportunity for local teachers, nurses, and others interested, to work for advanced degrees, or otherwise further their education, without leaving the county.
. . . Dr. Albert S. Pegues, former chairman of English at Southwester university and Southern Methodist university, will instruct a course on contemporary American literature, the first class to be held on the same day at 6:30 p. m. Professor Pegues has been a member of the English department at New York university since 1922. . . . The following appeared on 17 August 1946 in The Herald Statesman: The marriage of Mrs. Ellen Pegues Godfrey, daughter of Mr. and Mrs. Albert Shipp Pegues of 274 Park Hill Avenue [Yonkers], to Loeutenant Robert Brewer Robertson, U. S. Army Medical Corps, son of Mrs. Mildred Trafton Robertson of Presque Isle, Maine, and the late Charles Murch Robertson, took place yesterday at the Church of the Transfiguration (Little Church Around the Corner) in New York City. Teh Rev. Charles A. Weatherby heard the couple's vows at a 5 P. M. ceremony. The bride, given in marriage by her father, wore an aqua crepe dress with matching headband and veil. Her corsage was of white roses and stephanotis. Mrs. Radley Lippe of New York City was matron of honor in a pale gray crepe dress with matching hat and corsage of pink roses. Dr. Louis Royer of the Columbia Presbyterian Medical Center in New York City was best man. A reception followed at the Hotel Duane in New York City. The couple will make their home in West New Brighton, Staten Island. The Bride, whose father is professor emeritus of New York University, was the widow of Lieutenant Donald Clark Godfrey of the Army Air Forces, who was killed in a plane crash while in training in Florida in October, 1943. Mrs. Robertson was graduated from Yonkers High School and attended the Juilliard School of Music, to which she was awarded a scholarship by the Chaminade Club of Yonkers. An organist, she has been playing at Summer services at the Park Hill Reformed Church and Central Methodist Church. Lieutenant Robertson, former resident physician at the Columbia Presbyterian Medical Center, is stationed at Halloran Hospital on Staten Island. He entered service in early Spring. He was graduated from the University of Maine in 1940 and from the Long Island College of Medicine in December, 1943. He interned at Lenox Hill Hospital. The bridegroom is a member of Alpha Tau Omega, social fraternity, and Theta Kappa Psi, medical society. Albert Shipp Pegues died on 27 August 1960 in Yonkiers, Westchester County, New York, at 461 Riverdale Avenue at his residence. His wife Flora Meta Piehler became a widow at his death. He was interred at Warrenton City Cemetery, Warrenton, Warren County, Missouri. The following appeared on 29 August 1960 in The Herald Statesman: [Died] Albert Shipp Pegues, on August 27, 1960. Husband of Flora Piehler Pegues. Service at the Phillips Funeral Home, 50 Ludlow Street on Tuesday, at 4 p.m. Interment Warrenton, Mo. Please omit flowers. The following appeared on 29 August 1960 in The Herald Statesman: Dr. Albert Shipp Pegues, retired professor emeritus at New York University, died Saturday at his home, 461 Riverdale Ave. [Yonkers], after a short illness. Born in Cheraw, S.C., Feb. 19, 1875, he was graduated from Wofford College in Spartansburg, S.C., and did graduate work at the University of Chicago and Cornell University. He was conferred the honorary degree of Doctor of Literature from Southwestern University where he was dean of the English Department for many years. Also dean of the English Department aat Southern Methodist University in Dallas, Texas, Dr. Pegues came here in 1919 and taught English literature in NYU's School of Education until his retirement in 1945. He is survived by his wife, the former Flora Piehler, a daughter, Mrs. Ellen Robertson of Rumsson, N.J., former organist and choir director of the Lincoln Park Community Church here; a son, Robert Shipp Pegues of Yorktown Heights; and six grandchildren.